Arnwine, T and I headed over to the Cromwell Skatepark this evening and were joined by local BMX legend, Punk Rock Steve. Steve Morse is back in the 860 and riding his bike a ton. 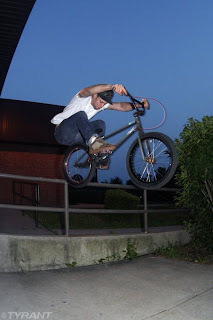 Nothings changed, Steve is still throwing down his dialed can can's, turndowns, peg manuals, etc. It was fun to ride with an old BMX friend, it's been 5+ years since we'd ridden with Steve. Good times for sure! Expect to see more or Steve on here in the near future. Arnwine was trying to hurricane the 5 foot quarter and was getting SO close. I guarantee he lands one in the next week. I had fun riding my Deuce Deuce on ramps for the first time. That bike is huge, but I love it! T and I are off to Boston till Sunday night with hopes of hitting up a few parks while we're up there. Have a rad weekend everyone! I gave the blog a little face lift today...and I'm sure I'll tweak a few more things here and there in the coming days. Gotta' keep it fresh! My new MacNeil Deuce Deuce is built up and ready to roll. 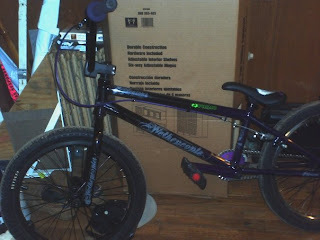 I owe Arnwine a huge thanks cause he built 90% of the bike up while I sat and BS'd with Macisco. I also owe Macisco and Tony's Bikes a huge thanks for the sweet hook-up! 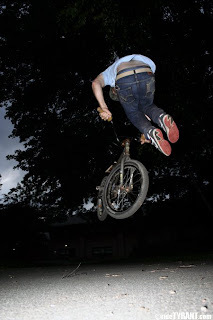 The bike is super long and the highlight of the night was watching Tom Burke trying to bunnyhop it and almost going OTB. I'm looking forward to getting out and riding...especially in Boston this weekend! 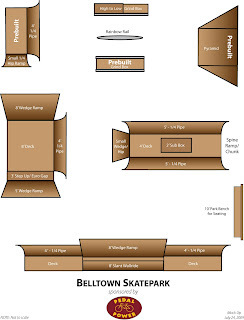 This is the mock up of the "Seasonal" Belltown Skatepark that will be down at Sears Park in East Hampton until the first threat of snow...and will re-open next Spring. Head over to The Belltown Skatepark Blog for more details. 3. I'm not in charge of the park project, just helping out, so don't rant to me! If I haven't seen you guys at any of the skatepark meetings, your input doesn't matter! Make an effort to help out, then you can talk! 4. Be grateful the town is willing to work with the riders and skaters at all. They easily could have said NO SKATEPARK! I headed over to The Lot last night around 6 to meet up with Arnwine and Bla. The guys sessioned the jumps for a bit, but it was super dry and hot a hell out in the open...so it was short lived! 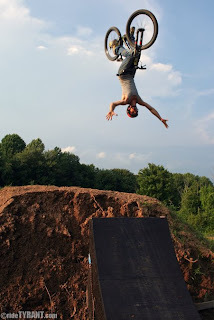 Arnwine was super close to landing a huge 360 whip and Dave threw down a huge tuck flip over the 2nd set. It was pretty wild out, there were thunderstorms just to the North of Middletown and you could see the lightning and hear the thunder, but it never rained. I worked Arnwine like a dog making him just up, over, and onto things for another hour after The Lot so we could get some street photos. Fun session, it's possible we'll be back at The Lot tonight. 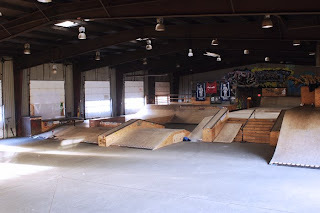 There is a new blog up for the Belltown Skatepark Go check it out! Arnwine and I rode Hartford this afternoon for the first time in over a year. We met up with Anthony Acock and some of his friends and it was a super fun session. The afternoon started off in Heaven with some heavy feeble grinding and some trickery on the POS quarterpipe that is there. We moved around town from there hitting up various spots between 2 flat tires and 1 run in with the law. Bry did a man sized bunny hop to ledge manual...a whopping 40" plus. We were all shocked! Bry was also hard up to fuf the sub rail on the I-84 of ramp by the Capitol so we all headed over to cheer Bry on. Bry bombs across the highway, shoots up the bank, fufs the rail, and as he lands back in the bank a Hartford Cop comes flying around the off ramp corner. In an instant the red and blue lights are on and over his loud speaker he says, "It is a $114 for fine riding a bike on a state highway"...we got the message and got the hell out of there...fast! Fortunately, the cop was cool and thanked us for leaving so promptly, gave us a wave, and was on his way. Phew! All in all it was a fun street session, something we haven't done in a long time. If anybody has some spare cash and wants to buy me a plane ticket I'd love to go check out this premire and watch Craig Samuels tear it up! 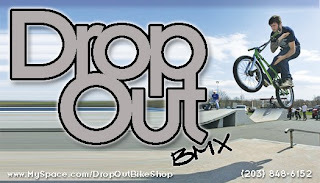 Apparently the crew over at Academy Skatepark is now permitting bikes on Mondays and Wednesdays. There is a flat rate fee of $20 which allows you to ride as little/much as you'd like from 1-9pm. Pegs are only permitted if they are plastic sleeved and capped or PLEGS...NO METAL, NO EXCEPTIONS! This park is a street riders delight with tons of ledges and rails, and there mini-ramp is swwwweeeet! I can't wait to get over there to ride! So I made a quick u-turn on my way to work this morning after I caught a glimpse of this potential wallride out of the corner of my eye. 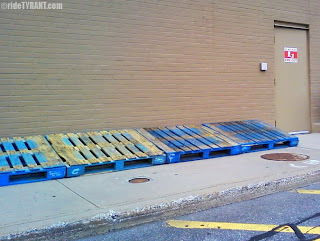 These pallettes are jacked up on parking blocks, I'm not sure what the purpose is, but with a little fine tuning this could make a pretty fun wallride to session for a bit one night later this week. This weekend was super fun, we did a ton of riding! We headed over to the Falcon BMX track on Friday night to meet up with Stampede Ben and his daughters to do a little riding. Everybody was hustling around the track having a good time and Bry and Blachura were boosting some tricks out and over the 3rd berm wall. We rode well into the darkness, gotta love those long Summer days! 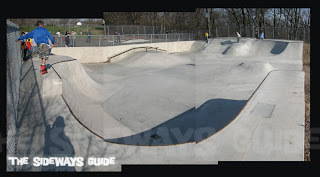 Yesterday we were on the road at 11am and headed to the Guilfrod Skatepark. The sun was blaring, it was in the mid-80's, and it was brutal riding...but we hung in for a few hours. More boosting was going on with Bry and Dave throwing down some tailwhips off the quarter to wedge. After cooking for nearly 2 hours we retreated to Krol's backyard for a little dirt action in the sahde. Pete's big line was pretty rough and needed some loving, so we rode the fiberglass quarter to dirt lander most of the afternoon. With a donated wheel from Arnwine, T's bike is now running 30/11 gearing and she was looking pretty comfy almost clearing the jump a number of times. 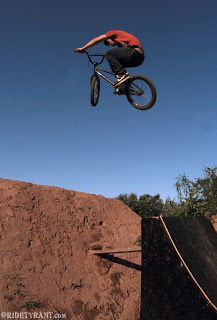 Krol was tweaking some mini-tables over the jump and coming damn close to landing 360's. I apologize, my camera batteries were dead and charging, so I didn't get any photos at Petes. After Pete's we all headed to The Lot to jump the newly revamped big line. With 6 foot wooden kickers and monster dirt landers the line was really intimidating, but most of us made it through. Arnwine was landing some pretty 360's off the 2nd set and clicking turndowns. Sadly, there were a few gnarly crashes late in the day. Blachura landed awkward off the 3rd jump and Krol's and rolled his ankle which resulted in immediate swelling. 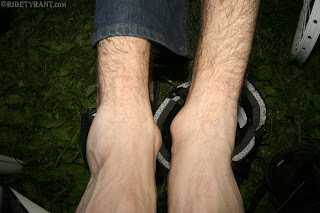 That thing is sprained for sure and Dave took the rest of the day off keeping ice on it. Damn, the Highland Comp. is in 4 days!!! Tiny TYRANT blasted over the 1st jump at The Lot and launched the 2nd one ever higher resulting in a scary mid-air bail out from 10 feet up. Brandon landed in a tuck-and-roll and got shaken up a bit. After the cobwebs cleared he had a nice strawberry burn on his right shoulder, but it could have been a lot worse! Brandon too took the rest of the day off. Despite the few falls, we rode for nearly 8 hours and everybody appeared to be having a good time. Hot fun in the Summer time! Check out the trailer below! 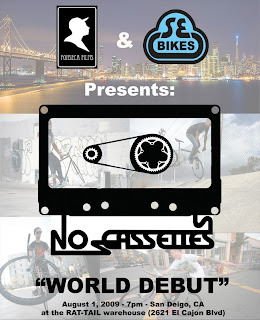 Craig Samuels has been hyping up this film "No Cassettes" to me for some time now and it appears it is almost done. Pretty gnarly full pipe action! Check out Begin's latest self filmed, self edited flick. 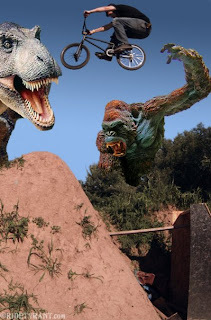 Tiny's getting handy with the camera and killing it on his bike! Web Video 4 from Brandon Begin on Vimeo.